The William Way Community Center encourages, supports, and advocates for the well-being and acceptance of sexual and gender minorities in the Greater Philadelphia region through service, recreational, educational, and cultural programming. The Center is currently open 365 days per year, offering an array of programming for 14,000 unique LGBT visitors and their allies annually. Our free programs include peer counseling, support groups, senior services, holiday meals, an art gallery, one of the largest LGBT archives in the country, a hiking club, weekly Tai Chi and meditation classes, and other recreational, health, fitness, employment, and educational opportunities. We also provide free and low-cost office and venue space to dozens of community groups and individuals providing valuable services relevant to our community and our neighbors, including hosting over 20 recovery groups each week at the Center. WILLIAM WAY LGBT COMMUNITY CENTER accepts donations. Donate Now. 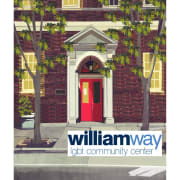 Would you recommend WILLIAM WAY LGBT COMMUNITY CENTER?